One of the tastiest ways to keep cool in summer is to munch on ice-cold watermelon. No summer picnic is complete without watermelon, but there's more to this fruit than its sweet, red center. The more than 50 varieties of watermelon grown worldwide give consumers many choices, with a wide range of sizes, shapes, and colors from which to choose. We are most familiar with the vivid reddish-pink flesh dotted with black seeds, but there are also white-, pink-, yellow- and orange-fleshed varieties, both with seeds and without. 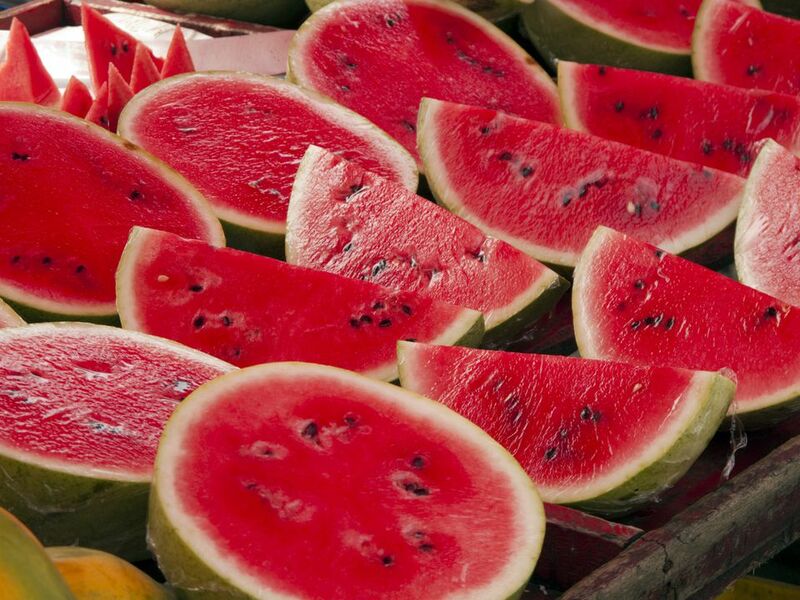 Watermelon can be divided into four categories: icebox, picnic, seedless, and yellow-orange fleshed. Each variety also features several types, and they vary in size, flesh color, and the sweetness of the flesh. The icebox watermelon is so called because the size of the melons—ranging from 5 to 15 pounds—which allows them to fit more easily in the refrigerator. They are bred to feed a single person or small family and include the Sugar Baby and the Tiger Baby varieties. The Sugar Baby has a dark green rind and sweet, red flesh; the Tiger Baby turns a gold color once it matures. Picnics are larger than the icebox variety, on average weighing between 15 to 50 pounds. Yet they can grow much bigger. In 1991, Bill Rogerson of North Carolina won a place in the Guinness Book of World Records for his gigantic 279-pound watermelon! This watermelon was named for the fact that there is enough to feed a large group—like when you are at a picnic or a backyard barbecue. This is the watermelon that most of us are familiar with—oval-shaped or round, bright green rind, and deep red flesh. Varieties of the picnic watermelon are Allsweet, Black Diamond, Charleston Gray, Crimson Sweet, and Jubilee. Seedless varieties are not truly seedless, but actually do contain tiny, white, edible immature seeds in lesser amounts than traditional watermelons. They were developed in the 1990s with the idea that some people don't enjoy spitting out the seeds of a watermelon. Seedless watermelons generally weigh between 10 and 20 pounds and have the same sweetness as the seeded variety. Names you may come across when shopping for seedless watermelon are Crimson, Jack of Hearts, King of Hearts, Millionaire, Nova, Queen of Hearts, and Trio. Inside these round or oblong varieties, the flesh will range from yellow to orange in color. They can be seedless or with seeds and can weigh anywhere from 10 to 30 pounds. The seedless varieties are Chiffon and Honeyheart, and the seeded names to look for are Desert King, Tendergold, Yellow Baby, and Yellow Doll. No matter which variety you choose, you don't have to just cut the watermelon into triangles and eat in hand. There are other ways to enjoy this refreshing fruit! Cut into cubes and tossed in a salad with feta cheese (the sweet and salty really complement each other) is a nice change from the standard bowl of greens. Or slice that watermelon into the traditional triangles but do the unexpected—place them on the grill! The sugar in the fruit caramelizes beautifully and the grill imparts a subtle smokey flavor. Sprinkle with a little spice and serve for a surprising dessert.